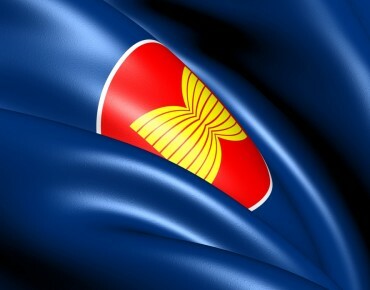 ASEAN’s solid growth in the past few decades has made it an enviable partner for many, and the economic bloc has entered into several high-profile free trade agreements (FTAs) in the past couple of years. As of the end of 2015, it has bilateral FTAs with Australia and New Zealand, China, India, Japan, and South Korea, essentially making it the formal economic crossroads between these leading world economies. Furthermore, it’s currently engaged in free trade negotiations with the EU and the Eurasian Union, which if ultimately sealed, would give ASEAN free trade rights with almost the entirety of the supercontinent with the exception of the Mideast and a small handful of other countries. With the convergence of so many economic interests over ASEAN, it’s only a matter of time before this smattering of bilateral agreements is expanded into a multilateral framework that progressively includes each of the given parties. Such an arrangement would represent a major victory for Eurasia and the multipolar world because it would tie each of the Great Powers together and make them collectively more interdependent on one another than either of them individually would be with the US. This is obviously a long-term vision and isn’t something that can be actualized in the scope of just a few years, but the path is already being paved the closer that ASEAN comes to inking free trade deals with the EU and the Eurasian Union. The increasingly intertwined FTAs that these respective economic partners reach with one another will inevitably bring them all closer together with time, despite existing political and structural differences between some of them such as the current American-dictated chill in the EU’s relations with the Eurasian Union. If given the chance to behave freely, the EU would likely intensify bilateral ties with the Eurasian Union as evidenced by Junker’s late-November 2015 outreach to the bloc, but US grand strategy has always been based on keeping the two divided, hence the manufactured Ukrainian Crisis and subsequently planned New Cold War. Should a breakthrough in bilateral relations occur, perhaps due to the structural changes that Balkan Stream and the Balkan Silk Road would generate inside the EU if either of them is successfully completed, then it’s probable that their overlapping economic interests in ASEAN (independently negotiated up until that point) could represent the perfect catalyst for banding together and formalizing a larger and more inclusive economic framework between all actors. The reasoning behind this is because the current American-attributed deterioration of EU-Eurasian Union relations is the only ‘non-natural’ structural impediment preventing all of the supercontinent’s trade blocs from cooperating on the all-inclusive scale suggested above. From the American strategic standpoint, however, this would represent the ultimate failure of its divide-and-rule policy in Eurasia, and it’s for this institutional reason why the US is so adamant about pursuing the Transatlantic Trade and Investment Partnership (TTIP) with the EU. In the event that this neo-imperialist proposal ever enters into force, then the US would have the dominant say in deciding whether its junior EU ‘partner’ is allowed to continue its existing free trade negotiations with Japan andIndia. More likely than not, it would indefinitely freeze these already-stalled processes in order to consolidate its economic control over the bloc, and only after it exercises indisputable control over it will Washington allow the talks to proceed. By that point, the goal would be to link TTIP and the TPP (which will be expanded upon shortly, but whose Asian component will be led by Japan) together to make the US the institutionally essential actor between them, and then complete the unipolar-dominated economic envelopment of Eurasia by bringing India into the mix to some capacity. 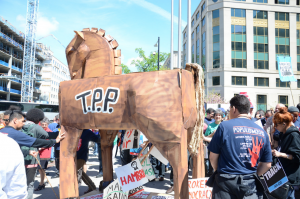 “Stop Fast Track” rally in Washington D.C., April 2015. This strategy is contingent on the US using the New Cold War hype that it’s created to scare its partners into agreeing to the TTIP and TPP out of the manufactured perception that they need to contain Russia and China, respectively. In the scenario being describe above, if the US doesn’t succeed in pushing through TTIP and the EU independently aligns itself with either of those major Asian economies (let alone that it begins free trade negotiations with China), then the US could rapidly lose its present preeminence over the EU economy. In a short time, Brussels might finally come to the conclusion that everyone else in the world has already arrived at and realize that the future of the global economy rests in the East, not the West, and enter into wider and freer trading relations with the rest of its prospective partners. This would of course naturally include Russia and the Eurasian Union, and with the two economies already converging on their own as it would be (remembering that it’s only because of American-attributed political impediments that they aren’t doing so already), it’s foreseeable that they could coordinate their respective FTAs with ASEAN as a final stepping stone before engaging in a similar one amongst themselves. As positive of a picture as the above section paints, it probably won’t happen for at least the coming decade, if at all, seeing how serious the US is in ‘playing for keeps’ within the New Cold War rivalry. Whether through the institutional workings of the TTIP or outside of it via more unscrupulous measures if the said agreement isn’t passed by that time, the US will do everything in its power to prevent the EU from expanding its independent economic relations with the Eurasian Union, China, and ASEAN. It might potentially be allowed to deepen its ties with Japan and India (per the unipolar grand strategy described previously), but even that is debatable unless the US feels assured enough that it can maintain control over the bloc after those prospective agreements are clinched. It probably wouldn’t have the confidence to do so unless it formally controlled the EU through TTIP, thus making these potential free trade areas unlikely, at least in the short- to medium-term timeframes, barring of course any unexpected geopolitical shifts. For the most part, then, the EU can be safely discounted from any serious discussions about intra-Eurasian free trade zones, but that doesn’t mean that such dreams should be discouraged simply because the bloc realistically can’t take part in them for a while (if at all). To compensate for the expected non-participation of the EU inside the envisioned multipolar economic frameworks, a few modified proposals have been suggested. Two of the most talked about are the Regional Comprehensive Economic Partnership(RCEP) and the Free Trade Area of the Asia-Pacific (FTAAP), both of which are actively supported by China. 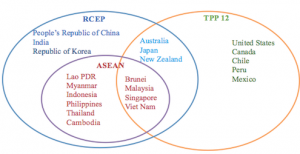 The RCEP is the formalization of a multilateral FTA between ASEAN and each of its already-existing free trade partners (Australia, China, India, Japan, New Zealand, and South Korea), while the FTAAP takes things a lot further and proposes a grandiose free trade zone among all the countries that constitute the Asia-Pacific Economic Cooperation (APEC) forum, thereby including Russia, the US, and a few other Western Hemispheric countries but at the expense of a full free trade deal with ASEAN as a whole (Myanmar, Laos, and Cambodia are not APEC members). Nevertheless, it’s still significant that most of the countries within the bloc would be participants in that framework, highlighting just how important ASEAN economies are for transregional free trade deals nowadays. At the same time, however, the inclusion of the US would greatly erode the multipolar flexibility of the intended grouping and turn it into more of an apolitical economic organization that can’t be used in a relative way to weaken the US’ unipolar standing. It’s probable that Russia and China only support this idea so as to score political points of their own in contrasting it with the US’ exclusionary TPP plans that threaten to undermine both Great Powers’ existing trade connections and future opportunities with the involved states. The latest proposal to be brought up for creating a multilateral transregional trading bloc came from Russia and was pronounced during President Putin’s Address to the Federal Assembly on 4 December, 2015. The Russian leader announced his country’s intention to form an economic partnership between the Eurasian Union, ASEAN, and SCO states (including the two ascending members of India and Pakistan), arguing that the new organization would “make up nearly a third of the global economy in terms of purchasing power parity.” This is the most realistic of the three suggestions and the most likely to be implemented in practice. China already has a FTA with Pakistan(the ‘zipper’ of Eurasian integration), and the Eurasian Union is exploring the possibility of sealing similar deals with India and official SCO-prospect Iran. Of note, Russia and China are also engaged in a trilateral partnership with Mongolia that could predictably become a free trade area sometime in the future as well. Assuming that Moscow will be successful in reaching these (and there’s no reason to doubt that at the moment), then joining the Eurasian Union and the SCO together in an economic partnership would be a natural fit, with ASEAN offering a perfect complementary touch that would economically excite all of the members. Furthermore, India and Pakistan’s inclusion into the discussed framework would likely lead to the rest of the South Asian Association for Regional Cooperation (SAARC, and which has its own internal free trade area) joining in as well, which would then push the proposed organization’s ranks to also include Afghanistan, Bangladesh, Bhutan, the Maldives, Nepal, and Sri Lanka. Taken together, Russia’s vision amounts to a Grand Eurasian Free Trade Area (GEFTA) that’s supposed to encompass the vast majority of Asia and one day merge with the EU, with the notable exclusions for now obviously being the European economies (both EU and non-EU-member states), the Mideast (except for perhaps Syria and Israel [an odd combination to be sure, but pursued forentirely separate reasons]), the Koreas, and Japan. Even assuming a minimum of external (American) interference in trying to offset Russia’s vision, it’s foreseeable that India will present a major challenge for GEFTA’s implementation. India and China are engaged in a very intense security dilemma at the moment that neither side publicly wants to acknowledge, and under such conditions, it’s not likely that either of them is serious about pursuing a FTA with the other. From New Delhi’s perspective, India has no motivation whatsoever to sacrifice what it feels to be its national economic interests by entering into a FTA with China, no matter if it’s in RCEP or GEFTA. Relating to RCEP, India already has FTAs with Japan and South Korea, and it doesn’t believe that including Australia and New Zealand into the proposed multilateral framework would compensate for the economic unbalancing that it thinks it would experience through the tariff-free trade with China that it would have to agree to as part of the deal. With respect to GEFTA, the concerns are very similar. India is currently in a free trade relationship with ASEAN and might eventually enter into one with Iran after the latter proposed such an idea in spring 2015. With progress looking quite positive in reaching a free trade deal with the Eurasian Union one day soon, India doesn’t see any need to jump into GEFTA when it’s already all but assured to receive every benefit that it would be seeking out of the arrangement minus the foreseen complications that would happen if it has to do so with China as well (and to which its leadership presently sees no benefit). India’s expected absence from GEFTA doesn’t translate into the vision’s failure, but it does raise its dependency on ASEAN’s inclusion in order to be geopolitically broad-based enough to become a defining point in the global economy. By itself, the Eurasian Union and its bilateral free trade arrangements are positive developments in and of themselves, especially if they lead to a prospective Eurasian Union-China FTA that multilaterally incorporates the other deals reached prior to that point (such as with Iran), but multipolarity would be infinitely more enhanced through the addition of ASEAN to this accord. Vietnam is already party to such a deal with the Eurasian Union, and even though it’s a robust component of the bloc’s partnership portfolio, its mutual potential pales in comparison to if both economic groupings had their own inclusive bloc-to-bloc pact. One of the steps in advancing this possibility would be for Russia to make efficient use out of ASEAN’s SEZs in Myanmar, Laos, and Cambodia in order to reach individual FTAs with the rest of the organization’s mainland members (including Thailand, whom Medvedev offered the possibility to in spring 2015) so that they can collectively lobby their insular counterparts in this direction. Andrew Korybko is the American political commentaror currently working for the Sputnik agency, exclusively for ORIENTAL REVIEW. This article is a select chapter from his second book that will focus on the geopolitical application of Hybrid Wars.